As he aged, architect Frank Lloyd Wright became a snowbird. He’d spend part of the year at his beloved Taliesin home, studio and architecture school in Spring Green, Wisconsin, and starting in 1937, wintered at Taliesin West outside Scottsdale, Arizona. Recently, the Frank Lloyd Wright Foundation teamed up with the Swiss optics company Leica to create a detailed 3D scan of Taliesin West, which allows people around the world to explore the architect’s constantly evolving property. According to a press release, the Foundation wanted high resolution, 3D digital scans for several reasons. First, it understands that many people simply can’t visit the desert property in person, though over 100,000 per year do make the pilgrimage. And Wright’s narrow, tiered layout makes the property almost impossible to access for visitors with mobility issues. So a scan is the next best thing. To capture the intricacies of the national landmark, Leica Geosystems used their new 3D imaging system, the Leica BLK360. The scanner not only takes 360-degree images of the property, it also creates a 3D point cloud, which uses lasers to take extremely accurate dimensions of walls, windows, even furniture and trees, down to an accuracy of just six millimeters. That data can then be imported into architectural and building software to help make decisions about conservation and restoration. The immersive 3D model was created by Matterport, a 3D media company. 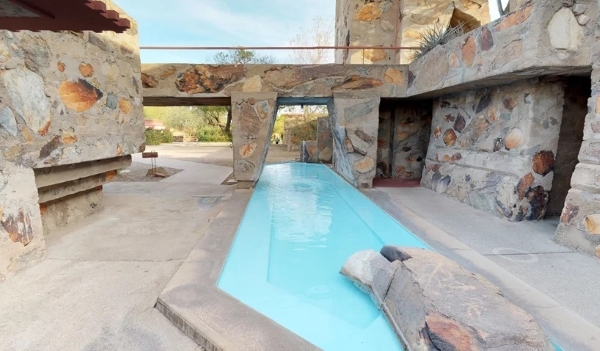 The virtual tour allows users to visit each room of Taliesin West and examine things like light fixtures and furniture, most of it designed by the architect himself. It also allows visitors to get up close with the desert rocks and other natural materials used in construction and view the surrounding Sonoran desert. Graff also says that disseminating Wright’s ideas and legacy is more important than ever. Wright is often cited as being the first “green architect,” though he would not have used that term. His idea of harmonizing his designs with their surroundings, instead of trying to overpower or dominate the landscape, is a principle of sustainability. He was also an advocate of using local materials in construction and using local plants for landscaping. “More than an architect of buildings, Wright was an architect of ideas whose time has come now with great urgency as we face great challenges to sustainability,” Graff says. According to the press release, Taliesin in Wisconsin will soon be scanned and available online as well.